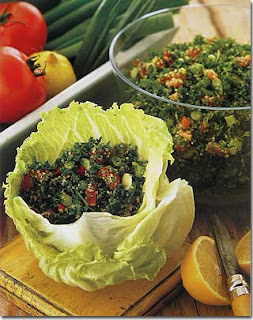 Tabbouleh is a famous salad dish in Lebanon, Syria and Jordan. 1 Wash the bourghoul in a deep dish by filling it with water and gently pouring out the water so that it will take away any impurity. 2 Leave the bourghoul to soak in cold water for 30 mn. 3 Finely dice the tomatoes and onion and chop the parsley and mint. 4 Mix together the oil, salt and lemon for the sauce. 5 Squeeze the borghoul between your hands to press out the water and mix all the ingredients together. The tabbouleh is best eaten with small lettuce leaves or better yet, fresh vine leaves rolled up in a cone shape.